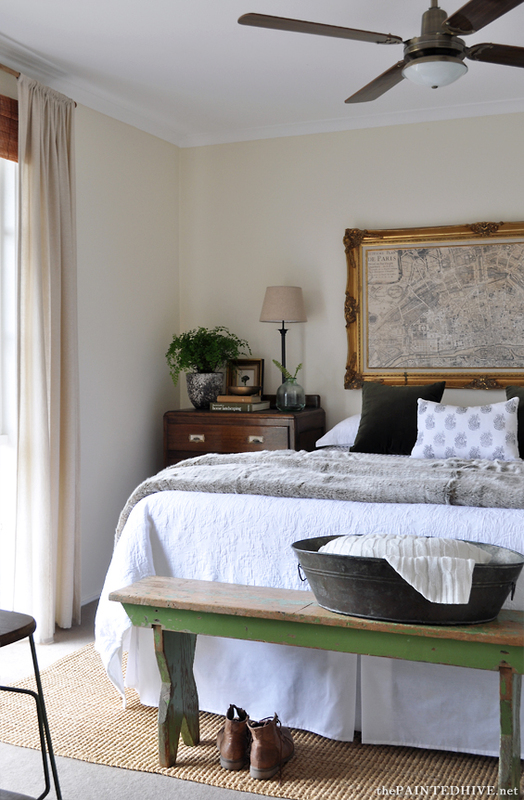 I last shared pics of my master bedroom over three and a half years ago. Not that I think there’s anything wrong with that. In fact, there’s actually lots that’s very right about it. You see, when I did share those pics, I also mentioned that creating spaces with a focus on longevity is a priority for me (don’t get me wrong though, I’m not saying that three and a half years is a particularly expansive length of time, however in the world of “home” blogging having exactly the same room scheme for more than five minutes kinda equates to infinity – plus, I have had all the main pieces since 2010 and plan to have them for many more years to come). I love the idea that my interior can stand the test of time. That it’s not dictated by trends. That I don’t tire of it after one day. 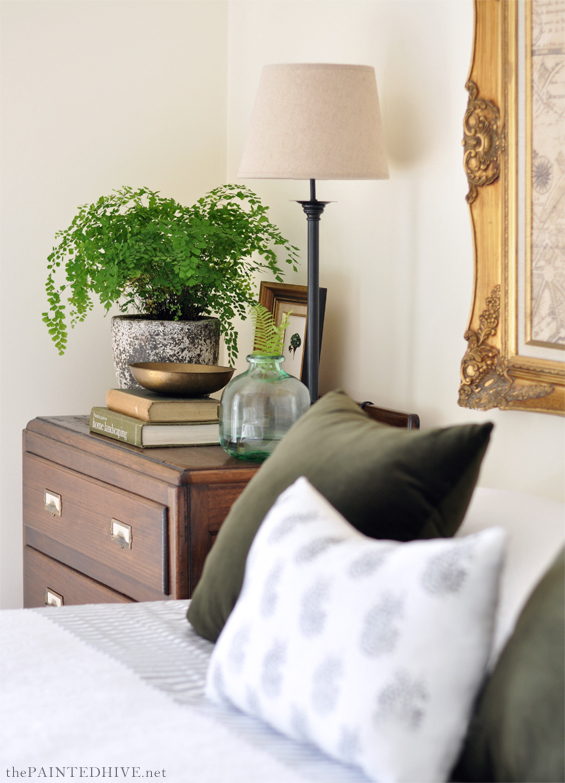 And that if I do ever feel the need for a change, it’s generally as simple as a new throw pillow and maidenhair fern (#fernobsessed)! All that said though, things do wear out, get relocated, and simply fail to evolve as desired in conjunction with your vision. And that’s exactly what happened in my master bedroom. Putting all that justifiable stuff aside however, sometimes it’s just plain fun to “play house” (something I haven’t done much of since having kids!). 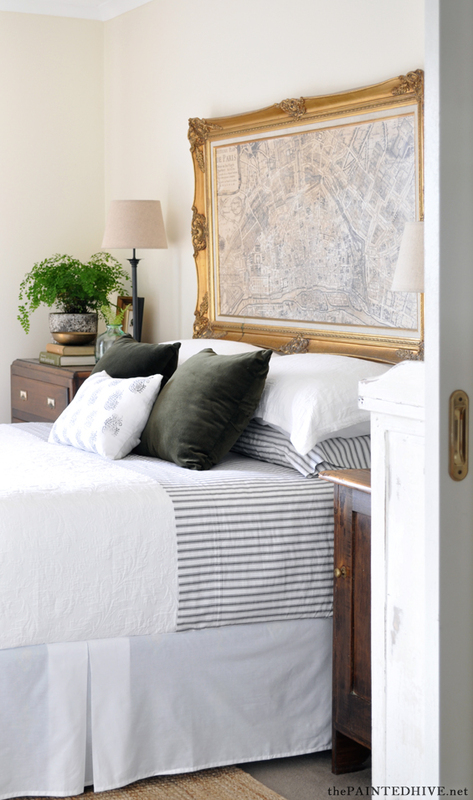 This mini refresh was actually sparked by our need for a new mattress. A need which happened to coincide with a fortuitous offer from Super Amart. 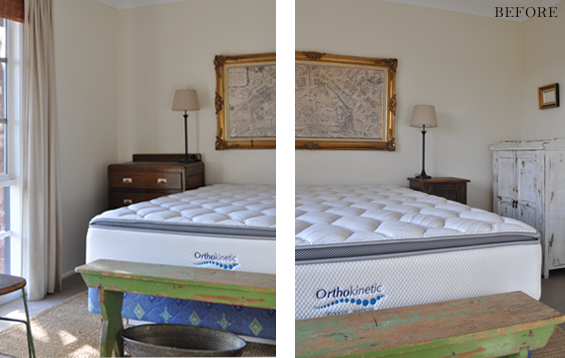 We were super lucky to have the opportunity to review an Orthokinetic Cirrus mattress. An opportunity which also gave me the perfect excuse to zhoosh-up our decaying bedding (the six year old valance, quilt cover and linen throw were starting to fall apart at the seams – quite literally!) 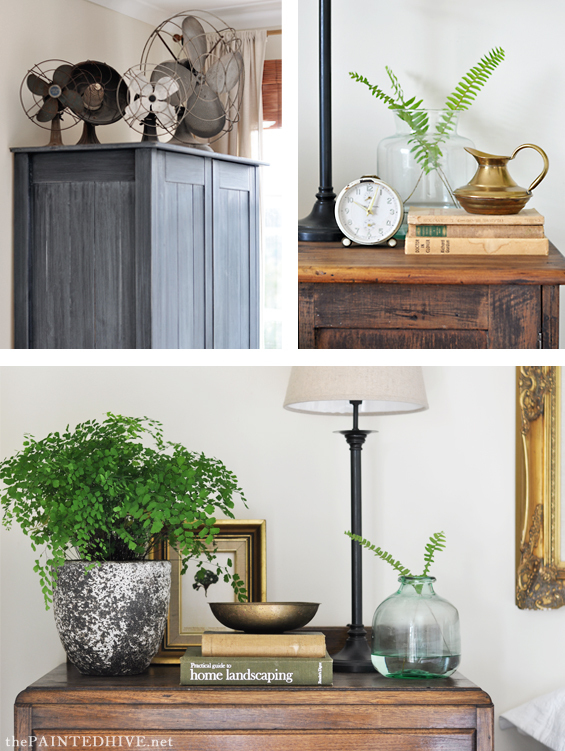 and collate some lovely new vignettes (my favourite past-time!). I rarely buy bedding. In fact, it’s something I pretty much reserve exclusively for my birthday. 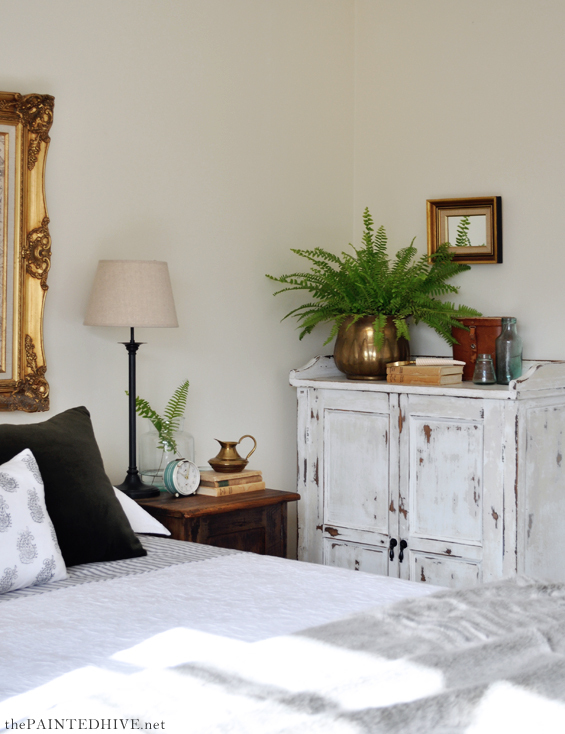 Unlike decor accents, which I generally pick-up super cheap from thrift shops or department stores, I am somewhat fussy when it comes to my linen. I don’t know what it is, I just seem to have specific “musts” in that realm. It’s not like I go out of my way to purchase expensive (to me) bedding, or that I believe a hefty price tag always equates to better quality, it’s just that Kmart doesn’t seem to sell the sheets and quilt covers I really want! Anyhoo, to dress our new bed I used a fresh valance (in the same style as the original one – just less irrevocably stained), my gorgeous new ticking sheets (again, similar to what I previously had – just less threadbare) and a new white quilt cover (once more, not unlike the preceding one – just with fewer holes). 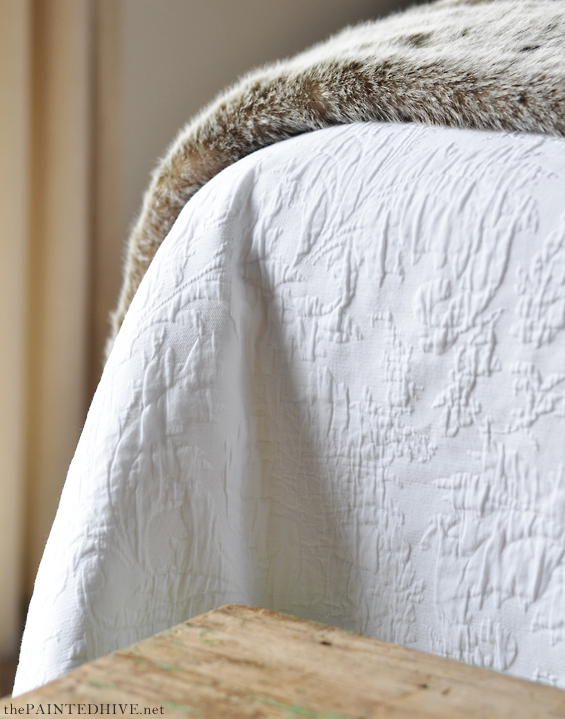 Although quilted, the doona cover is quite light-weight which is perfect for my husband, who tends to over-heat, and great for me too because I have a thing for quilted doona covers and absolutely MUST HAVE ONE – win-win! This design is really cool too. It’s a pretty damask of sorts though has a slightly distressed finish which prevents it from looking overly feminine and hides all those unwanted wrinkles! 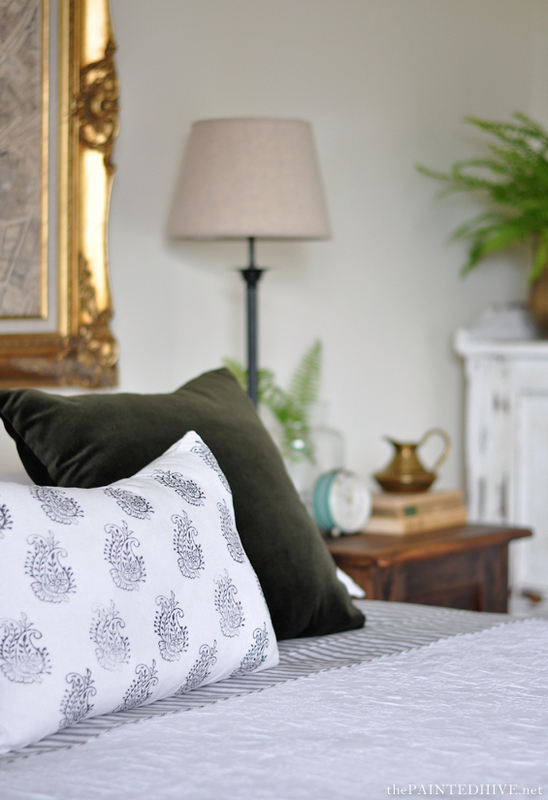 I also opted for a different pillow configuration; horizontal standard pillows, two deep green velvet throw cushions (which I made myself with fabric from Spotlight), and a block-printed lumbar pillow (again, made by myself – you can find the stamping tutorial here). 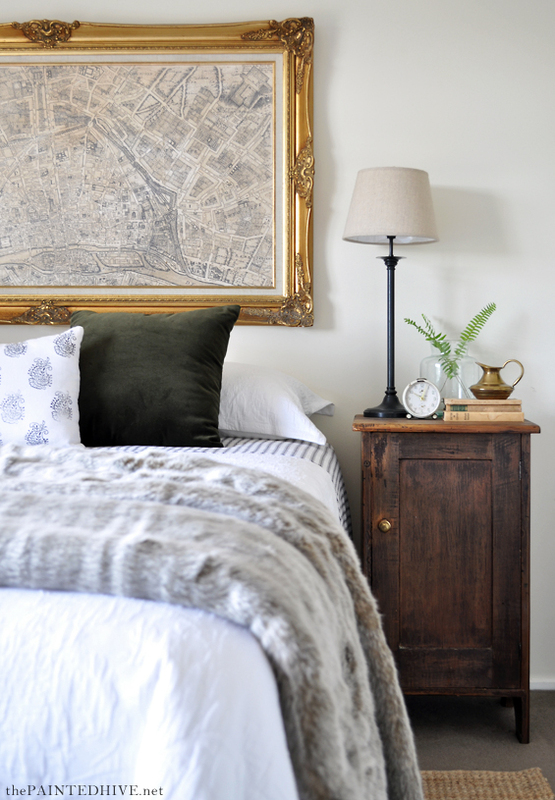 And to accent the green cushions and break-up all the white I took a slight risk on a sumptuous faux fur coverlet. 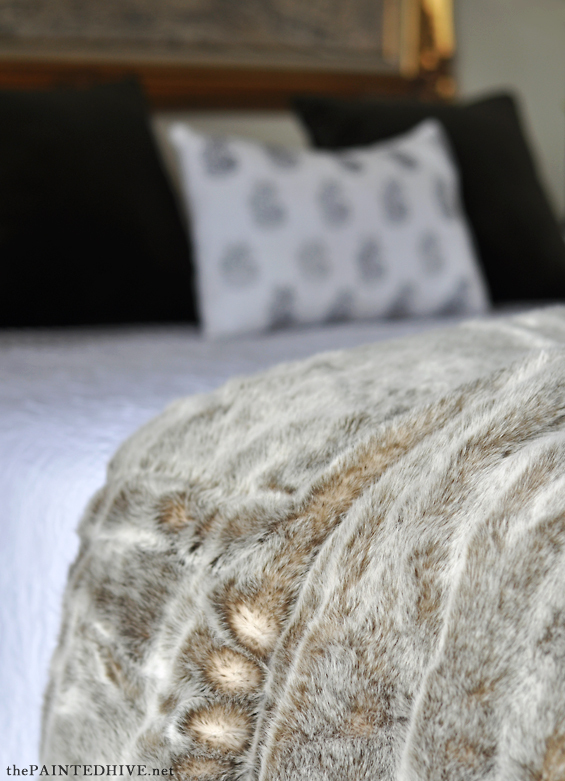 I must admit, I’ve been somewhat critical of faux fur in the past though I absolutely LOVE this throw! The first night we slept with it on the bed, my husband snuggled into it and said “I feel like John Snow”. Ha, ha. I played around with a few different dressing options; such as draping the coverlet over the end of the bed, stacking the pillows, forgoing the throw cushion, and tucking the quilt and sheet under the mattress. So, if you notice the bed is styled differently from pic to pic, that’s why. All of the bedding items were birthday gifts or purchased on sale. I’m wrapt with the fresh look of the bed, though all the pretty trimmings don’t count for much if it isn’t comfy to sleep in. I must admit, it took some adjusting. We’ve never owned a decent mattress before and compared to our ten year old blob – complete with custom body divots – it felt incredibly firm, bordering on hard even. Initially, I definitely regretted our decision to go with the ‘medium’ though after a few days I began to adapt and started to feel the benefits. I’m generally a pretty good sleeper though have been through a restless patch over the past few months. I don’t know if I can attribute my recent improved slumber to the new mattress, though I have definitely been sleeping more soundly since its arrival. I can’t say it’s like sleeping on a cloud (however the price tag isn’t sky high either – ha, see what I did there?). That said, it is comfy and very supportive. A massive upgrade on our previous “blob”. I like it. Heaps better than our old mattress. Ahyhoo, along with the subtle changes to the bedding, I’ve also switched out the curtains. I actually did this around two years back. The original white sheers were just starting to discolour and, to be honest, the messiness of their flimsy tabs always bothered me. I replaced the black rod and finials with a real bamboo pole and wooden drawer knobs (similar to what I did here in Charlotte’s room) and the updated drapes are the LENDA from Ikea. The LENDA come with tabs – which is fine, just not my favourite – so I simply removed them and created a basic rod pocket. I realise a rod pocket isn’t necessarily a step-up on tabs, nor is it the most sophisticated or tailored form of curtain heading, though something about it works for me in this room. Finally, to freshen-up the general vibe, some re-accessorising was called for! I first removed all of the existing decor pieces (which wasn’t difficult given most of the accessories from the “three-and-a-half-years-ago” pics had already been relocated elsewhere in my home!). I love working from scratch when refreshing the decor in a space. Even if you plan on using some of the existing pieces (as I did), I believe it’s still helpful to remove them first. There’s just something therapeutic about starting with a blank canvas – for me, it offers a sense of clarity and helps open my mind to new possibilities. 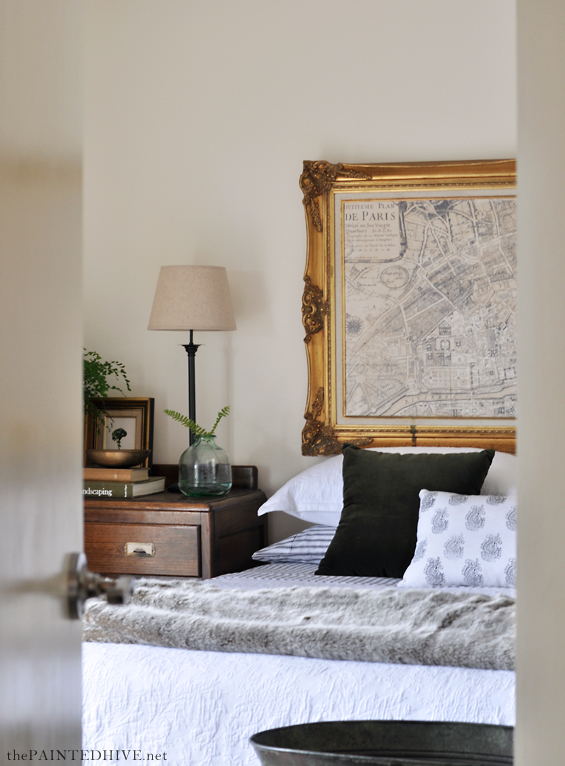 I wanted to retain the room’s natural, layered, slightly vintage, collected feel, so I reinstated many of the original accessories. All of the “new” items are pieces I already owned. 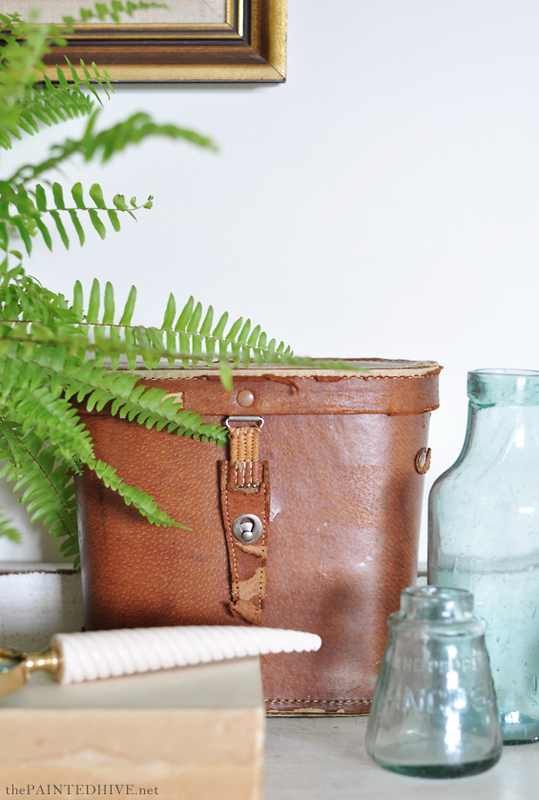 Nothing has been purchased specifically for the space and pretty much everything was originally thrifted. I know in comparison to my pics from three and a half years back, the changes appear to be quite subtle. As mentioned above though, since then many of the original items have worn out and moved on so for me the transformation is actually pretty substantial – and everything just feels so good! I received no remuneration in exchange for writing this blog post however I was gifted an Orthokinetic Mattress for the purpose of a review. Thanks for a peep at your ‘new’ room! 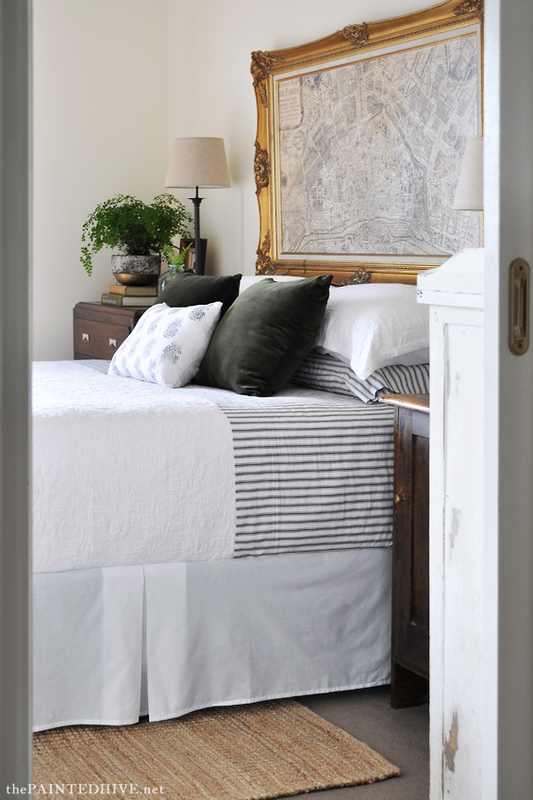 I absolutely love the ticking sheets and they’re a great contrast to the white quilt cover. I’m a white bedspread kinda girl, simply because it’s classic, can be coupled with any colour if wanting a change, and will last the test of time. Funnily, I was looking at the Arctic Faux Fur yesterday and contemplating whether to buy it! I think you just helped me make up my mind! Your room looks so lovely and very relaxed and relaxing. It always interests me, what does one do with their clock radios in these beautiful rooms!?? I’ve yet to find an attractive one! If you do decide to purchase the Arctic Faux Fur, just be mindful that it comes in two sizes. Mine is the larger version which is a queen coverlet. The smaller one is simply a throw. I must admit, we don’t have clock radios. I don’t use any type of bedside clock (the one in the pics doesn’t even work – it just looks pretty!). My kids are experts at getting me up on time (unfortunately) though if I do need an extra early start I just use my mobile phone alarm. My husband has a digital clock/weather station though it’s only very small (concealed by the little stack of books and brass bowl) and isn’t overly ugly. It’s also battery operated so requires no cords. My dad uses a clock radio and you’re right, it is hard to find a pretty one! In the past he has had the standard black/silver plastic ones (yuk), though at the moment is using a more stylish one from Kmart (http://www.kmart.com.au/product/wood-style-clock-radio/551335). It’s actually not too difficult to come across attractive enough modern/retro ones, though it is tricky to find one that would fit into a more classic scheme. Where in the world did you find your ticking sheets? 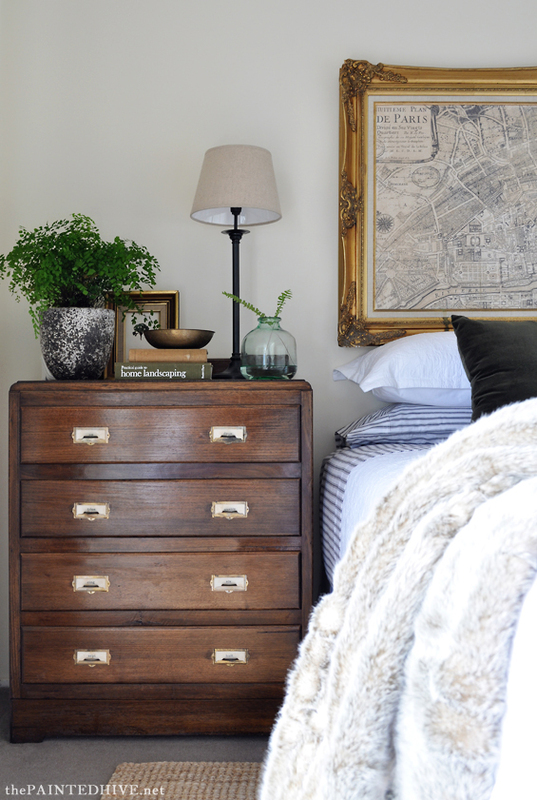 Really enjoy your blog…and your bedroom! Thanks Cornelia. There is a link in the post though it’s easy to miss. 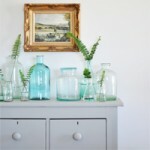 They are from Taylor Road which is a New Zealand based online homewares store (http://taylorroad.co.nz/). I’m not certain which country you’re in, though I could not find any in the colour I wanted here in Australia. They aren’t cheap though I was really lucky to get my sheet set for 60% off. If you’re in the US (or any other country that actually has a decent range of stuff – unlike here! ), you should be able to find some. Do a few Google searches for “Charcoal Ticking Sheets” or similar. Where did you purchase the faux fur cover? I love!!! It’s great, isn’t it Kat? There’s a link in the post though I’ll forgive you for missing it ;) I actually found it at Bed, Bath n Table which is an Australian store. I believe you’re in the US though Kat? Maybe have a Google around. I’m sure you’ll be able to find something similar. Thanks guys :) As always, I really appreciate your comments. Just gorgeous as always. 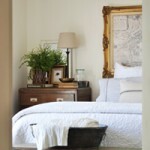 I absoletey ADORE your style and I literally want to live in your bedroom! Where are the sheets and throw from? Also, thanks for the mattress info. I’m in the market for a new one and don’t want to spend too much though want something decent. I will go and take a look. There are links to both the sheet set and throw in the post. 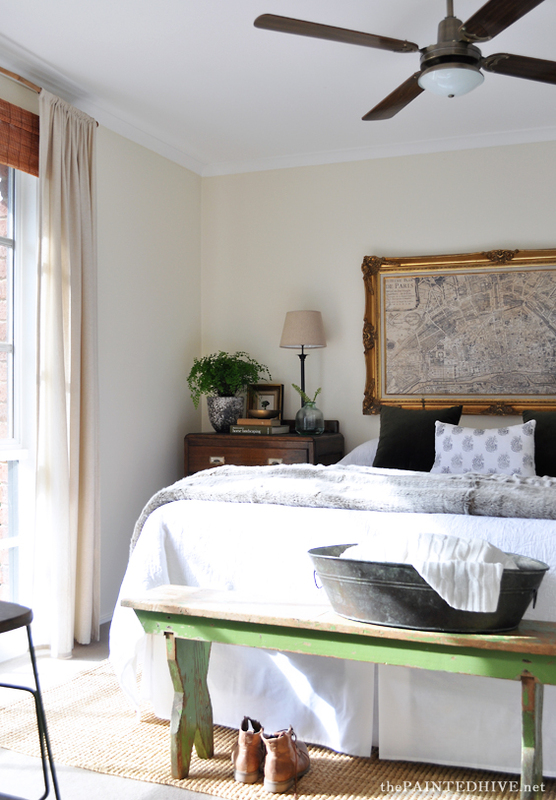 The throw (well, it’s actually a full-sized coverlet) is currently on sale from Bed, Bath n Table, and the ticking sheets came from Taylor Road which is a New Zealand based online homewares store. Everything looks so fresh and classic. We bought our first new mattress last fall- and at first I tossed and turned all night- fearing it was too hard. Now, however, I sleep so soundly. It has made a huge difference. Glad you have adjusted and are enjoying your bed. 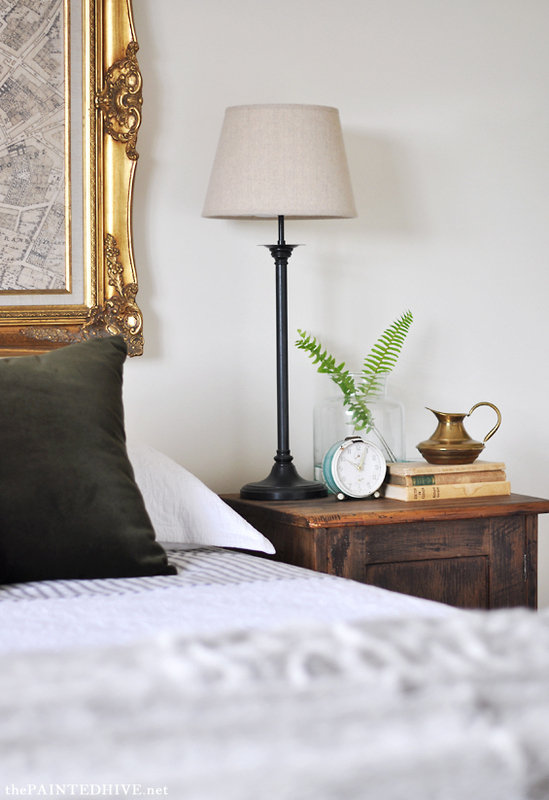 Love the velvet pillows paired with the ticking- and that green bench is always a favorite. Yes, you totally get my initial mattress regret then! I was so sad at first. Though just like you I now sleep way better than before. d] because i needed another point lol i will definitely be checking that link out from canada for those ticking sheets. love! Thanks Meg. It’s always so nice to see a comment from you because I totally agree that we are definitely style sisters! And twins at that! I really appreciate how you mentioned my intent. It is tempting to be un-true to yourself in this big, wide, bloggy world. And sometimes it feels like that might be the best (maybe even only) way to get ahead. Thankfully, there are lovely peeps like you who not only “get me” though also appreciate what I do and lift me up by openly sharing as much. This is the reason I love your blog and your style. I just don’t have the inclination or the money to be continuously changing things about. 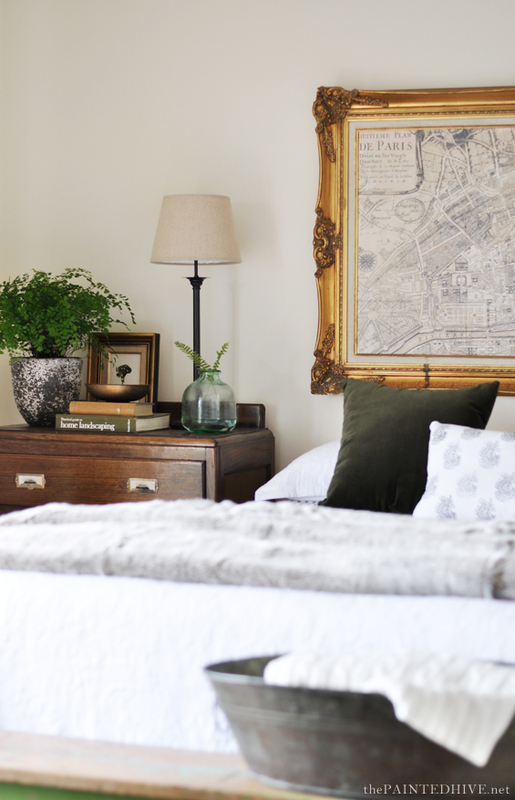 I owned my previous cast iron bed for more than 25 years and it took nearly a year of prowling through bedding stores, the internet and catalogues before I found one in my price range that I loved enough to live with for another twenty-five. And now I want ticking sheets. Ha, ha. Love that last little line. I completely love your honesty— everything changes up in the blog world within 5 minutes for sure and I often think it’s a virtual reality show! My main pieces have to last but I do love to mix and match the smaller things..plants really do it for me and yours made me a true follower! We just purchased a new mattress 6 months ago and I felt it was a bit hard, too, especially since our previous one was ultra firm as well, albeit old. But support is really great and a while after I settle in I’m fine. Thanks Jane. Yep, mixing-up the accessories is the way to go for me too! Pillows can be tricky. I tried a few different configuration before I settled on this one. Just takes a bit of playing around me thinks. Not only do I just LOVE your style, but I also really appreciate your patient, purposeful approach to decorating. It’s so refreshing and inspiring :). Bravo for keeping it real! Your room looks great! I found a ticking duvet cover set at IKEA recently. I just love it. You have given me some ideas for what will look good with it. Did you get the Hostoga or the Nyponros from Ikea? I’m thinking about using one in my daughter’s room. Thanks for the tour of your new room. It looks beautiful! This, Kristine, is one of the things I love about your blog. 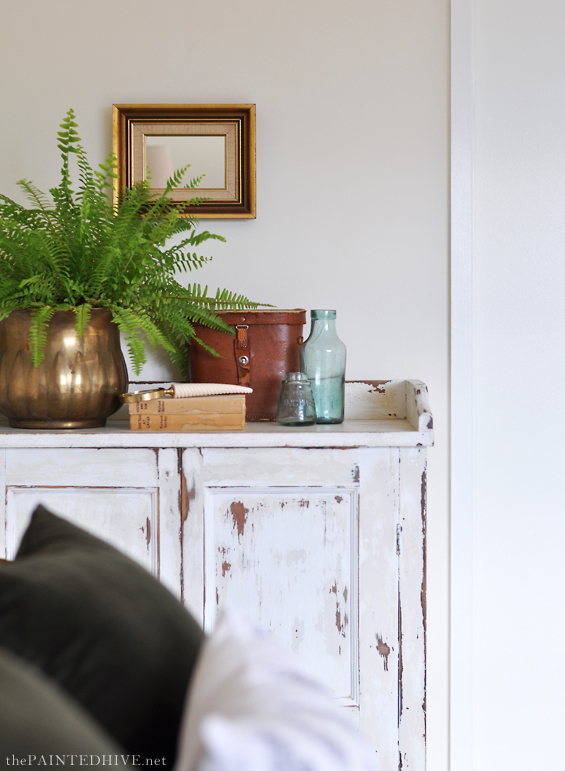 The fact that you decorate to your own taste, not fads, and do it with an eye for keeping the same decor for awhile makes you my favorite decor blogger. I feel like you’re simply doing your own thing in your home, and inviting us along for the ride, rather than constantly changing things just to create content. Bloggers who constantly change things create discontent, for me at least, with my home and make me feel like I can’t keep up. So thank you for doing things just the way you do – keep up the good work! And having said all that, I love the room update! Thank you so much Kelley. I think you’ve hit the nail on the head in terms of the way I have chosen to blog. The fact there are peeps who like to come along for the ride is just the icing on the cake! I would like to post a bit more frequently though that will come when my kids are a bit older. You make it look so easy! Thanks for the great article and some real inspiration. Those blue wicker chairs look very striking. Hello! I love your room make over , and really love the fan! Where did you get it? We are having a horrible time finding a fan for our room! Not sure which country you’re in, though we got it years ago from a lighting store here in Australia called Beacon. I liked the quilt cover. Looks soft and comfy. You have got a well managed bedroom. I like how you use a mixture of traditional and vintage with a little bit of modern, yet it is all very clean and comfortable/homey looking. I usually see stiff or overdone, expensive versions, but you left it classy and fairly simple. You have decor, but not too much. We live on a tight budget and need to pick home decor that won’t be out of date in 10 years. 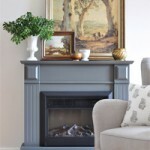 The way you updated your Mom’s living area was very relaxed and comfortable but with classical elements. You have a lot of talent. Thanks so much Teresa. 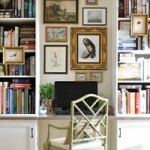 Yep, decorating with some longevity in mind is definitely an important aspect for me. Not only does it save spending money on frequent re-decorating though also the time and work involved. I’m so happy to be acquainted with your site! BRAVO-LOVE IT! What color is your bedroom wall paint? Thanks Cat. The walls are “Chalk USA” by Dulux. Love everything but especially the ticking sheets.